Gulu: A total of 1500 boda boda cyclists and 100 tax drivers have registered to carry students who will participate in the East Africa school games scheduled for next month in Gulu town organizers have revealed. Anthony Ojok, the event’s transport officer, said his team has registered boda bodas and taxis and given them tournament tags to help transport participants from the venues to their residences and vice-versa. He said cyclists and taxi drivers without tags will not be allowed to ferry guests. Mr Ojok said the move aims at protecting visitors from conmen who may want to take advantage of the visitors’ failure to understand the local dialect. Earlier last week, police held a security meeting with hotel and lodge owners in the area as part of preparations for the tournament. Aswa region police spokesperson Jimmy Okema said at least 25 hotel owners attended the meeting held at St Joseph Layibi College on Wednesday. 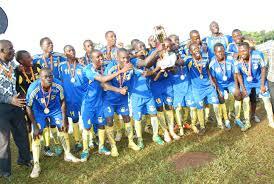 Masaka SS football team. Soccer is one of the games to be played at the East African Schools’ championship. Courtesy photo. Okema assured participants of security but added that those who will stay in hotels and lodges will be cared for by the owners of the business places. He cautioned guests to be careful and ensure safety of their property. “This is a major sporting event that brings together all countries of East Africa, the public should be vigilant and report any threat of terrorism,” Okema said, adding that Al-Shabaab are fond of taking advantage of big gatherings such as sport and rallies to cause mayhem. He noted that about 17 state-of-the-art hotels have been set aside for officials from the different East African countries. He added that 42 ordinary hotels have been registered for other ordinary visitors. St Joseph College, Layibi and Sacred Heart Girls School shall host the numerous schools expected while Pece and Kaunda shall be the main stadia for the games that will range from from outdoor games like Athletics, football, rugby, basketball, netball, handball, hockey, volleyball to the indoor one like chess, badminton and swimming. Last year’s games were hosted in Kenya, Eldoret. Aludo Otto head of Sacred Heart is delighted to host the games. “We are very honoured that we shall be hosting over 100 schools for the secondary school games. This is a big chance to show the world how hospitable Gulu and Uganda is,” Otto said. Over 5,000 people are expected to turn up for the games which start on August 16.